No kid should ever be without a Christmas. That’s the motto of the Old Newsboys’ Goodfellow Fund of Detroit. This year’s annual breakfast tribute honored Peter Karmanos Jr., the recently retired CEO of Compuware. Pete is a visionary and philanthropist along with his wife Danialle. The breakfast was held at the renovated Cobo Hall with beautiful vistas of the Detroit River. The choir from the Detroit Academy of Arts and Sciences entertained the crowd. In the top right photo Karmanos is with some of the students. Carmen Harlan and Devin Scillian from WDIV TV (top right) introduced Karmanos. 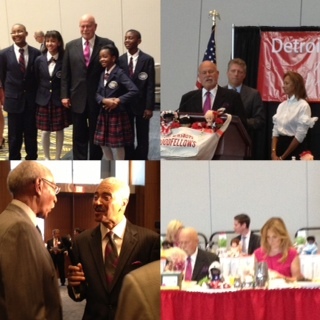 In the lower left photo, Fox2 Detroit TV Anchor Huel Perkins interviews Mayor Dave Bing.